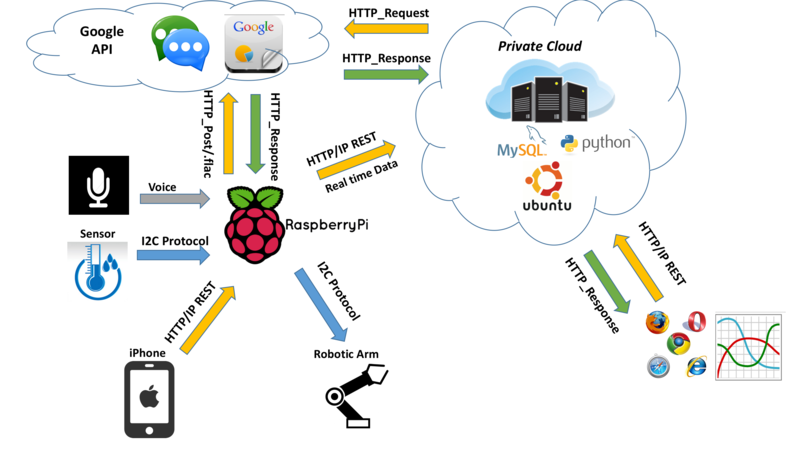 The lab project covers a broad range of Internet of Things(IoT) scope involving REST API, Cloud Server, IOS App Design and Robotic Arm actuator. The ultimate goal of lab is to introduce students to the world of IoT and provide them with powerful tools for their final project. By the end of the lab project, students will have a basic understanding of M2M communication, modern computer network and embedded programming. The following chart illustrates a good preview of the lab project. The lab project will be divided into 6 to 7 sections depending on students’ process. TA will be present leading the lab sections and help students finish their tasks.